Oil on canvas, 19 1/2 x 31 1/2 in. 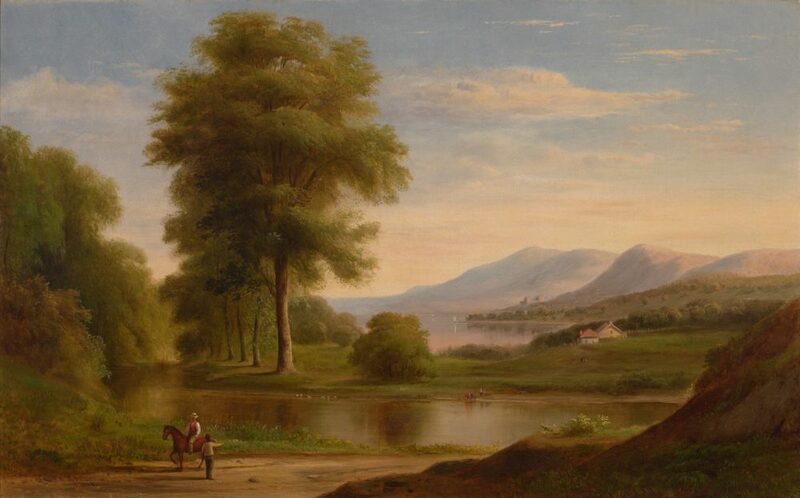 Robert Duncanson was the first African-American artist to gain national and international fame. In his lifetime, critics placed him in the top tier of the Hudson River School, labeled him “the greatest landscape painter in the West,” and compared his paintings to work by Frederic Edwin Church and especially Thomas Cole. He traveled widely through North America, Britain, and Europe, where his work found ready buyers among merchants and aristocrats. Duncanson settled in Canada in 1863. He avoided the United States for nearly the duration of the Civil War, when the status of African Americans was being contested on the field of battle. In Montreal, Duncanson’s work reached its apex. Without abandoning poetic content, he tempered it with a picturesque realism, perhaps influenced by the British landscape tradition, painting tourist sites throughout Quebec. He exhibited his work frequently in Montreal, and was considered the leading landscape painter in Canada. Duncanson is credited with inspiring young Canadian artists to take up nature as their subject, some art historians even have suggested that he single-handedly started a national school of Canadian landscape painting. Although the title of this painting is not currently known, its date of 1864 indicates that it likely depicts a location in Quebec. A pathway connects to the picture plane at the far left, providing an access point for the eye, and on the right, it becomes hidden by a shaded hill. This mass of dirt and rock is diagonally opposed with a stand of trees in the left middle ground. A small strip of land in the center of the painting frames a lake beyond, and mountains fade into aerial perspective in the far distance. In the foreground, a standing man seems to ask a mounted figure for directions, and across the river or inlet a group of people appear to picnic on the shore. Duncanson struck a balance in this work between wilderness and cultivation, neither overwhelming the other. Farmlands on the right are nestled within remnants of forest, and don’t dominate them. He added narrative in the interaction between the rider and walker in the left foreground and the picnicking group in the middle ground, showing that nature was used for both business and pleasure.